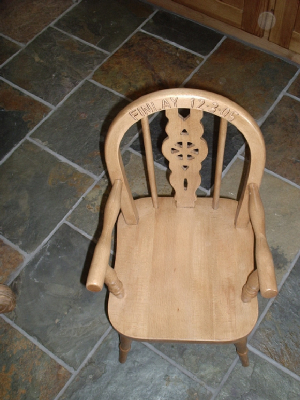 We carve items such as these using a conbination of hand held router and hand carving chisels. The final product then provides the customer with a family hairloom which will be treasured by whoever receives it. OR JUST AS A SPONTANIOUS GIFT ! We can carve onto almost anything we make. 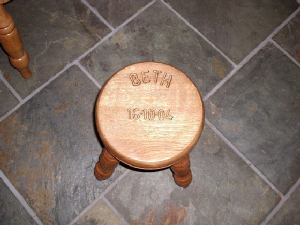 We charge a standard £1.50 per letter or number carved into all our chairs and stools or jewelry boxes as these are normally a standard size of around 20mm high,15mm wide. For items such as toy boxes then there is more work involved as the characters are much bigger and as a rough guide we then charge £2.00 per letter or number. All other prices for artwork such as love hearts or carved animals which include teddy bears, piglets, etc has to be worked out at the time of order dependant upon the size and amount of detail required. We can work from our designs or yours at no extra cost and it usually takes around one week maximum to do carved work providing we have the item in stock that you want us to carve onto. 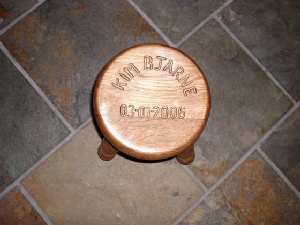 We can also carve onto items that you may wish to bring into the shop yourself.